Sherlock Holmes is possibly one of the best known fictional characters in literature and film. The detective from the works of Sir Arthur Conan Doyle has been portrayed by many film- and seriemakers in very different ways and settings. The best known recent versions of the Holmes character are probably Benedict Cumberbatch in Sherlock (2010) and Robert Downey Jr. in the Guy Ritchie films. But throughout cinematic history, there have been many interpretations and interesting performances teaching us several different things about Sherlock Holmes. They sometimes even creatively add to the original stories of Doyle. 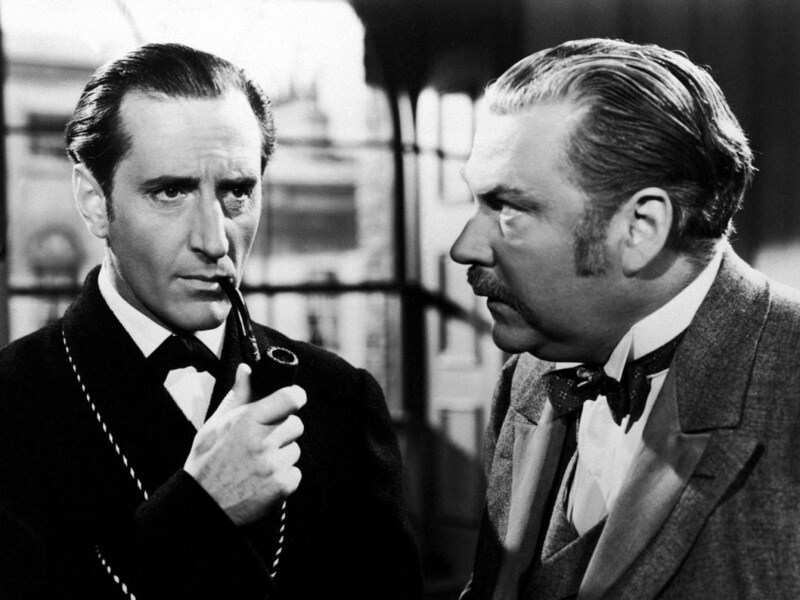 Between 1939 and 1946 a series of fourteen films about Sherlock Holmes and his companion, Dr. John Watson, was made with Basil Ratbone as Holmes and Nigel Bruce as Watson. Many fans still say that Rathbone is the one and only Sherlock Holmes, just like Sean Connery still is the one and only James Bond. The writers of the many films with Rathbone and Bruce gave Dr. Watson a very important role next to Sherlock, practically making it unthinkable that Sherlock Holmes could exist without him in future portrayals, of which there have been many. The strength of the Rathbone performance lies in the confident deduction and his many disguises, which will be recognized merely because they become predictable. The performances by Rathbone are excellent. As for Bruce, his acting feels a bit more ‘commutable’ but again he defined the duo of Holmes and Watson. 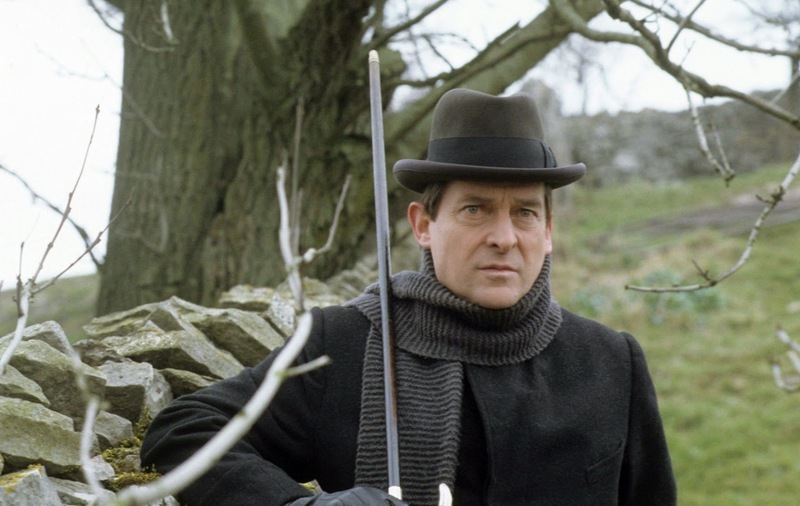 During the 80s, Jeremy Brett portrayed the detective in many TV movies. Several fans will claim Brett to be the one and only Sherlock Holmes over Basil Rathbone. Let’s call Brett the Roger Moore of the Sherlock legacy. Compared to Rathbone, his acting feels more serious and mature. Rathbone sometimes makes you feel like you’re watching fiction combined with comedy, especially when he uses his many disguises. Brett delivers a Sherlock that makes you believe that the mysteries are happening in a more serious and tangible world. However, Brett’s Watson, played by Edward Hardwicke, feels very forgettable. Sherlock Holmes His Childhood and His Late Years. In 1985, Barry Levinson directed Young Sherlock Holmes. A film that is fictional, in the sense that it isn’t based on Doyle’s novels. It suggests that the start of the friendship between Holmes and Watson happened in high school, where Holmes already shows off his deductive skills. The battle between him and a ‘villain’ classmate resembles the later Harry Potter movies. The serious crime story depicted in this film is not very realistic in the way Holmes solves it and endangers himself and Watson. But this film is a nice exercise in trying to give some more background in the early years of Sherlock Holmes leading up to his later typical character. More or less the same goes for the older Sherlock Holmes. He is portrayed by Ian McKellen in Mr. Holmes (2015). Sherlock is 93-years-old and seems to be a bit more empathetic and less cocky than in his earlier years. He is working on his final case while he slowly experiences the first stages of Alzheimer’s. The most interesting element of the film is the friendship between Holmes and the son of his housekeeper, Roger. He teaches Roger his hobby of beekeeping. A Popular Interpretation: House M.D. 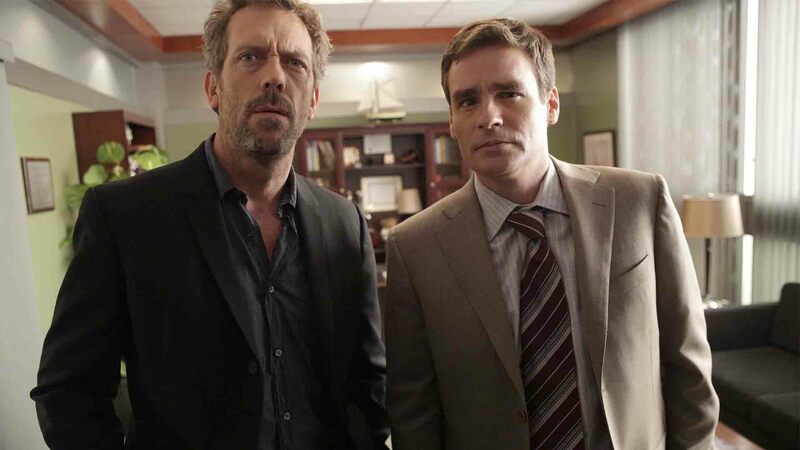 Perhaps not known or recognized by everyone, but Hugh Laurie’s role as Dr. House was based on Sherlock Holmes, with Wilson as Watson. The character trades of Holmes were focussing (obviously) on medical deduction, almost obsessively wanting to solve puzzles but also his ability to spot the slightest details about people and knowing basically everything about them. Of course, not literally portraying the character of Sherlock Holmes, things like his injury was added. It did help explain his need for the use of drugs, something Holmes was doing as well. IMDb confirms that tons of Sherlock Holmes adaptations have been made over the years. A lot of them are true to the source material. One would think that over the course of cinema’s history a masterpiece from a distinguished filmmaker about Sherlock Holmes has been made. This is not really the case. Most, if not all, films and series portraying the detective are ‘middle of the road’ material. When will a big filmmaker stand up to create a Sherlock Holmes masterpiece? Recently Guy Ritchie gave it a try with his overstylized portrayal by the charismatic Robert Downey Jr. Not a bad attempt, but unfortunately Ritchie’s talent does not lie in a telling a compelling and suspenseful mystery. His Sherlock Holmes is more a showcase for Downey’s talent and Ritchie’s graphic action scenes. The more violent and fighting detective mostly serves Ritchie’s style and not so much the character of Sherlock Holmes. Entertaining but not the most accurate and best depiction of the source material. Perhaps the most popular recent adaptation is the series Sherlock (2010). Not a bad effort but unfortunately feels overarched and complex compared to the source material. Especially over the course of four seasons. The first two seasons felt fresh and managed to make the series a modern update. Unfortunately things became more and more predictable and, even worse, unrealistic. Benedict Cumberbatch’s performance ranks with those of Rathbone and Brett. He leans more into the autistic and anti-social, just like the protagonist of one of today’s most popular sitcoms: The Big Bang Theory’s Sheldon. So, although several efforts have been made, the real Sherlock Holmes ‘masterpiece’ adaptation is still to be produced. The older films with Basil Rathbone are entertaining, but never really distinguish themselves on a cinematic level. More or less the same holds for the Jeremy Brett TV-movies. As discussed, the later efforts have their mistakes as well. 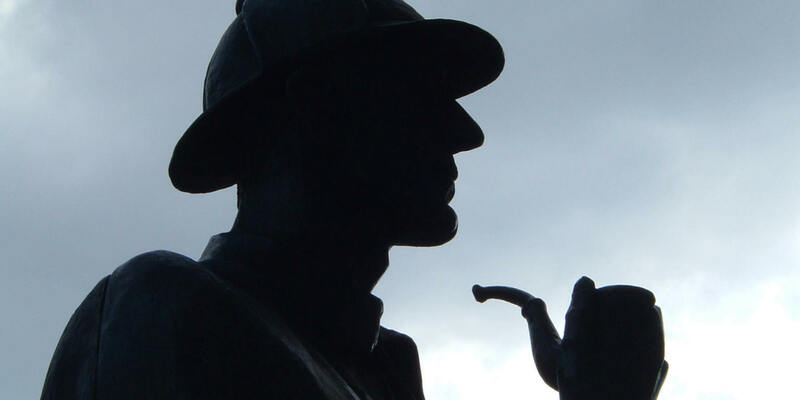 The franchise of the detective had so many productions over the course of the years that it may feel overdone and a risk to make ‘just another’ Sherlock Holmes movie. But who knows what the cinematic future may bring? Donnie & Louise save the world!